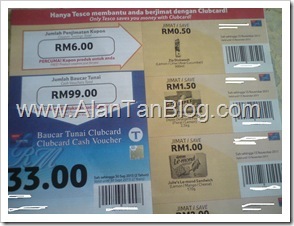 It’s very good to get a cash back on my grocery shopping at Tesco Stores (Malaysia) Sdn. Bhd. This’s made possible by applying for a FREE Tesco Stores Clubcard. You able to collect Clubcard points for every dollar you spend on shopping with Tesco. Every RM2 spend will entitle you to collect 1 Clubcard points. 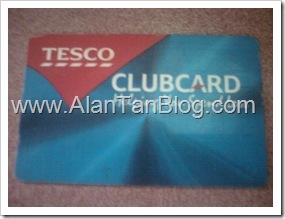 For 150 Clubcard points and above collected, Tesco Stores (Malaysia) Sdn. Bhd will convert them into Clubcard Cash Vouchers. The Clubcard Cash Vouchers is just like a cash where you can spend your shopping at Tesco and is send out every quarter. Therefore, the more points you collect, the more you’ll get back in your Clubcard Statement every quarter. A dollar save is a dollar earn! Always remember to bring and swipe your Tesco Stores Clubcard every time you shop in Tesco. They have spend a lot of money in paper advertisement and marketing, to market their Brand and products. What I like about shopping at Tesco, the car parking is free and fast check out payment counter. Over 1,000,000 happy customers have received their Clubcard Cash Vouchers. Have you got yours? Tesco Stores (Malaysia) Sdn. Bhd. was incepted on 29 November 2001, as a strategic alliance between Tesco Plc UK and local conglomerate, Sime Darby Berhad of which the latter holds 30% of the total shares. Tesco Malaysia commenced operations in February 2002 with the opening of its first hypermarket in Puchong, Selangor. The hypermarket format offers customers a complete one stop shopping experience for their needs with everything from fresh foods to groceries, and even apparel. It carries more than 60,000 lines of products including nearly 3,000 of its own brand of products ranging from food to non-food items. The Tesco Extra format serves the needs of small businesses, families and individuals all under one roof by providing a comprehensive range of products and services focused on small businesses. These include bigger pack sizes, special trolleys and checkouts as well as a dedicated business development team to support small business owners with their orders. Mission: To create value for customers to earn their lifetime loyalty. This entry was posted on Wednesday, September 21st, 2011 at 10:51 am	and is filed under Tips. You can follow any responses to this entry through the RSS 2.0 feed. Both comments and pings are currently closed.